It’s another glorious morning in Rome and this one begins with a sumptuous breakfast on the rooftop terrace of the Hotel Hosianum Palace, included in my room rate. 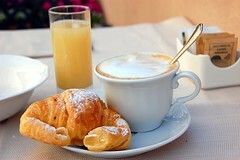 With the dollar as weak as it is, I feast long and well on eggs and bacon, cornetto and cappuccino. 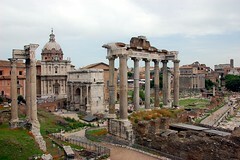 It’s 9:30 AM by the time I reach the Roman Forum, a site I deferred on Thursday due to rain. Rick Steves is my companion again as I enter from Via dei Fori Imperiali with my Roma Pass and iPod in hand. At this hour, the air is cool and breezy and my walk through the ruins of ancient Rome, from the Arch of Titus to the Temple of Saturn, up the Palantine Hill and back, is as pleasant as pleasant can be. As I stand staring at the spot on which Julius Caesar’s body was cremated following his assassination, something deep in the corner of my brain stirs. “Friends, Roman, countrymen, lend me your ears. I come to bury Caesar, not to praise him.” Eleventh grade English, ingrained after all these years. The bard and Mr. Yerger would be proud. I have to navigate through a pressing crowd and a persistent band of Gladiators next to reach the Colosseum. Do I want a bella foto with them, they ask? No, not really. Not for what they charge. The line for pass holders is comparatively short and within ten minutes time I’m standing on the upper level of the arena looking down. It’s mammoth in size, but familiar in shape and structure. It’s like any modern sports complex, but without the product placement. When I see Ann and Mel there, too, we’re surprised yet again by the chance encounter and use the occasion to snap pictures for one another. 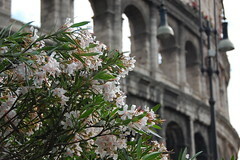 From here, I take a long, slow walk north through the historic center of Rome. I have a 3:00 PM reservation at the Borghese Gallery, but figure I have plenty of time to get there. I stop to wonder at the Pantheon and its giant oculus, break for gelato in Piazza Colonna, then move on to the Spanish Steps, where I’m disappointed to see that scaffolding still surrounds the obelisk at the top. It’s a stark column of gray steel, like a miniature skyscraper, obscuring the façade of the church of Trinità dei Monti. It’s from the top of the Spanish Steps that I first notice a problem. On many levels, the free paper map in my hand is a poor substitute for the laminated, tri-fold, beauty I lost at Castel Sant’Angelo. In particular, I see now that it fails to mark the location of the Borghese Gallery. Either the museum is beyond the northern border of the map, or it’s hidden behind an ill-placed advertisement for the Castel Romano designer outlet mall! I don’t know which. Remembering that the gallery is located in the Villa Borghese, I follow the first sign for that I see, which leads me left. As it turns out, this is a mistake. A big, honking mistake. Once in the lush surroundings of the park, I ask a couple sitting on a park bench for directions. They point me down a long gravel path, past a playground and a carousel. From there, I spot a sign pointing towards the Galleria Borghese, which I follow in premature elation. I spy another sign that takes me in another direction, then another, and another. By the time I reach my destination at last, I’m cranky, exhausted, and very nearly late. By brain tells me that I’ve walked about three miles from the Colosseum, but to my aching body it feels more like twenty. Walk there. What a dumb idea. The staff at the Borghese Gallery understand human nature well. They must be determined to avoid the scene at the Sistine Chapel, because they make visitors check their bags and cameras at the door. What’s left of my belongings—my wallet and the storage card from my Nikon D40 for safe keeping—are placed in a clear plastic bag for all to see. They also insist on a reserved time slot that lasts no more than two hours. No crushing crowds here. I rent an audioguide and join the queue outside, along with a boisterous group of young nuns. As we filter through the rooms, I have a hard time shaking them and their behavior is becoming more and more distracting. I’m trying to appreciate Canova’s neoclassical masterpiece of Paolina Borghese as Venus Victrix, but one of the nuns decides to jump up on an empty pedestal, sit there, and swing her feet. When our eyes make contact, she quickly hops down and looks away, but laughs just the same. A few minutes later, I see a baseball cap hanging from the outstretched hand of another sculpture. And, of course, there are the nuns, giggling harder than ever. I’m tempted to report them to security, but when I enter the room with Bernini’s “Apollo and Daphne,” I’m struck dumb. It’s stunning, more delicate and expressive than anything I saw at the Louvre last year. It looks like it was molded out of wax instead of marble, as if it would be soft and hot to the touch. I wouldn’t dare, of course, but I bet I could get one of the nuns to do it for me! About halfway through the Correggio exhibit, my energy gives out at last and I decide to call it a day. I’m relieved to find a taxi nearby and ride it all the way back to my hotel, where I take a nice, long nap in my air conditioned room. By dinner time, I feel somewhat revived. Determined to stay close to home, I turn right out of the hotel lobby instead of left. Left is the direction that brings me within yards of Piazza Venezia; right takes me to a whole other world. These are the charming streets and alleyways that border and then sink slowly into the heart of the Jewish Ghetto. 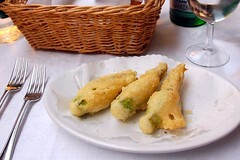 There, just around the corner from my hotel, I stop to eat at “La Taverna degli Amici.” I order a house specialty, fiori di zucca (fried zucchini flowers stuffed with ricotta), followed by bombolotti with cheese and bacon. I feel a long way away from that tourist trap near the Ponte Sant’Angelo. This is how I imagine Roman food should taste, with fresh, seasonal ingredients, simply prepared. 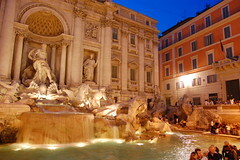 Afterwards, still enjoying the night, I follow a steady stream of people towards the Trevi Fountain, which in reality is a massive wall of marble fronted by a pool of aqua blue. I stand with my back to the water, facing the masses, and toss a coin over my shoulder, then several more. Whether it be the stuff of legend or Hollywood movies, I’m not taking any chances. 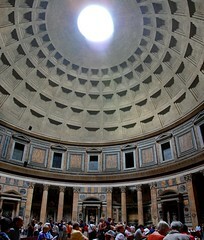 I want to ensure a return visit to Rome someday. Soon. As I head back to the hotel, I take a slow and circuitous route that allows me to pause in front of the Pantheon one last time. There is a young man performing in front of an appreciative crowd. He trades off between violin and voice, moving from what sounds like the “Flight of the Bumblebee” to a stirring rendition of “O Sole Mio,” and finally “Che Sera.” With deliberate disregard for the exchange rate, I reward him gladly and well. This is magic, after all.